Monochromatic. “adjective; containing or using only one color: monochromatic light.” Before the technology was available, all film and photography was rendered in black and white. In film, it saw its heyday in film noir. As for photography, you need know but one name – Ansel Adams. With the advent of color film stock, the art of black and white photography nearly died. Thanks to a few diehards, it remained on life support. But done properly and with the right tools, black and white imagery can be incredibly powerful and astonishingly beautiful. And that brings us to this month’s review. The people at Macphun have in their collection of tools that will aid you in reviving this long, lost art. 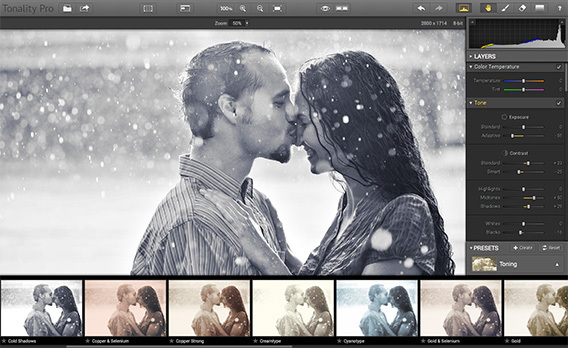 To create amazing black and white images you’ll want to use Tonality. 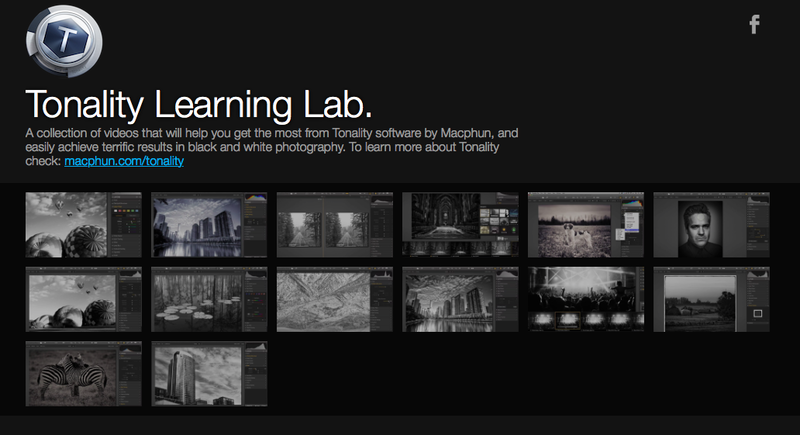 To learn how to use all of the various tools, Macphun has a collection of over a dozen videos they call the “Tonality Learning Lab.” Here you’ll be instructed how to navigate the interface, how to intelligently use presets, how to properly apply grain, use layers (up to seven) to enhance your compositions and more. There are fourteen tutorials in all. If you’re really only interested in presets, Tonality has your back with 50 presets, all of which are adjustable. You can also mark your favorite presets by clicking on the star just below it. You can import custom presets plus create your presets of your own and save them for future use. And you’re not limited to one preset per image. By incorporating layers, you can combine presets. Couple this with your ability to adjust the presets and you have quite a powerful tool even when using it at its base level. Also when you use your presets with layers, the tools that your selected preset is using will light up on the right hand side of your interface. 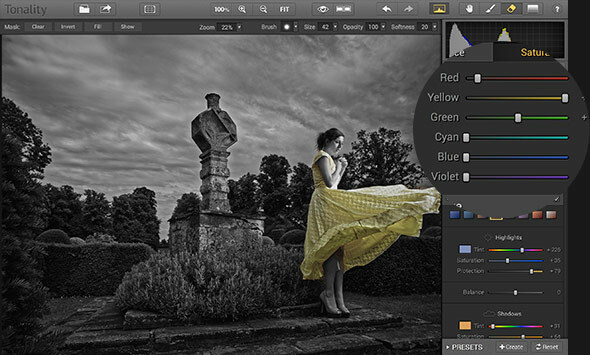 Tonality can stand as a separate application or be used professionally as a plug-in within Photoshop, Lightroom, Photoshop Elements and Aperture. There’s Authentic film emulation presets, native RAW support with 16-bit image processing, support of the most popular image formats from JPEG to PSD, texture overlays (24 available) with export custom textures capabilities and over a dozen more high-end features. When finished, you have the option of exporting your final image to their print lab for high quality print images. And has become the norm, you can export to your favorite Social Media venue all without having to leave Tonality. Oddly, as I have a degree in Film/Video, you would think that I would have an extensive library of snaps. But in reality, the converse is the truth. So, I am learning a lot using this app. One of the tools that I found most useful as an amateur was the Navigation Tool. It brings up a small pane that allows you to zoom in and focus on a specific region of your photograph, enabling you to work on fine details. There’s also a Split Screen tool that will bring up ‘before’ and ‘after’ renderings of the project you’re working on side-by-side. As a bonus, you can arrange the screen to perform your comparison in either portrait or landscape mode, whichever workflow you prefer. Tonality has a histogram feature, which to be honest, as a neophyte, I haven’t completely wrapped my head around as of yet. To really get a feel for Tonality, watch their training videos several times to understand using all of the tools in greater detail. – “Plug-in support for Adobe PS, Lightroom, Apple Aperture. I encourage you, at the very least, to try the trial of Tonality. Go and take several photographs or grab a photo from your library (particularly one that you thought was extremely ordinary) and open it up in Tonality. Start adjusting it into a black and white image using the techniques that you have learned. I guarantee you that you’ll be amazed at the number of hidden gems that reside in your library. Perhaps you have talent you hadn’t realized! This entry was posted on Tuesday, September 8th, 2015 at 12:06 am	and tagged with Apple, Apple software, Apple Software reviews, Frank Petrie, Photgraphy, Photographic software, reviews, YMP, YMP Now and posted in Reviews. You can follow any responses to this entry through the RSS 2.0 feed.